Marketing Strategy Musings - Strategy Dude (Edmund Wong's blog): Taylor Swift's UPS partnership to promote new Reputation album - WHY!?!? Taylor Swift's UPS partnership to promote new Reputation album - WHY!?!? Spotted a huge picture of Taylor Swift yesterday in the street. Thought it was one of those moving billboard trucks until I realized it was a UPS truck! First of all, I think it's interesting that UPS is pimping out ad space on its trucks, like a public transit bus. I didn't even realize they had an interest in building out an ad business. Perhaps the fight with FedEx has them looking to expand to other revenue streams. It's not a bad idea for UPS to monetize that huge boring brown space across their fleet of trucks. Some might say the UPS partnership is a good offline marketing vehicle. It's 100% share of voice. And people don't go to record stores (R.I.P. Tower Records!) anymore and even the Best Buys and Targets of the world aren't really selling many physical albums these days to warrant in-store promotions as users are digitally streaming or downloading music. But if you're TAYLOR SWIFT, why do you even need to spend money to advertise your new album? She's world famous with reporters, radio DJs, bloggers, and her fans hanging on her every word and ready to buy her latest music! She's recently released 2 singles, Look What You Made Me Do and Ready For It, from the new Reputation album weeks apart and both are getting lots of air play! All she has to do is post on her own social media channels and call it a day. Her other profiles are all promoting it too. 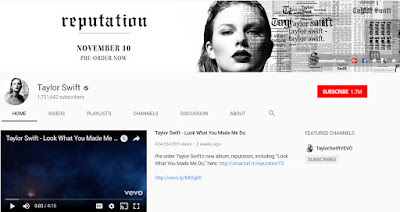 In fact, it's a great example of integrated marketing as all the channels have the same Reputation album cover photo and call to action to get her album on Nov 10th. You may recall she caused an Internet frenzy when all her social accounts went dark last month to prep and coordinate all this stuff.